Summer. Picknick. Cool drinks. Colorful straws. 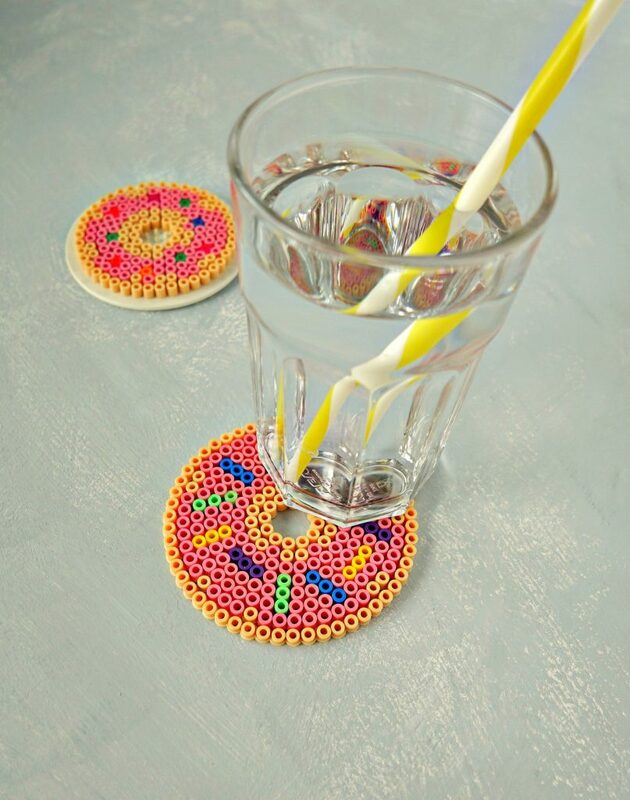 Fun beaded coasters. Shall I continue? 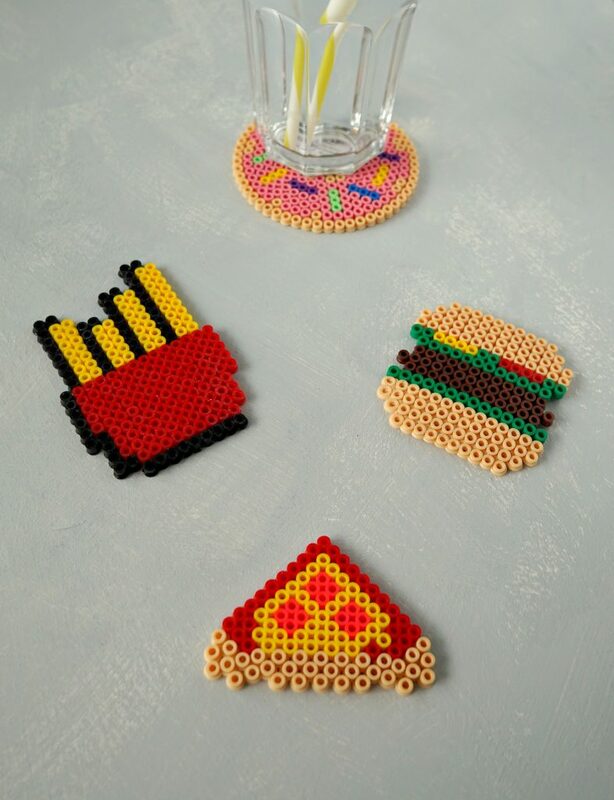 I’m so happy that perler beads haven’t gone out of style yet, because A. they’re great to re-live fond childhood memories and B. you can make the most amazing DIYs with them! 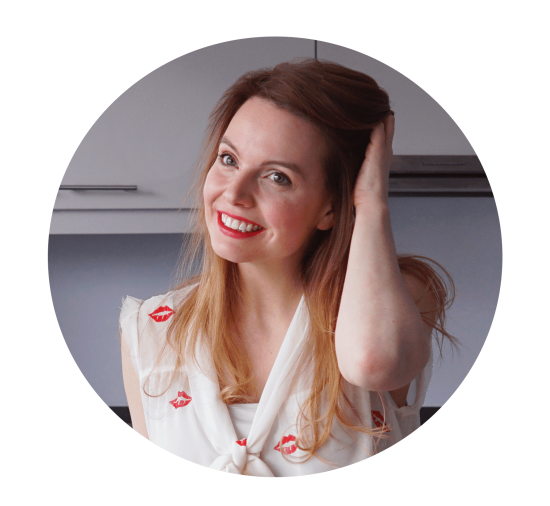 Perler beads seem to be as popular as ever, and you can pretty much buy them anywhere, from your local craft store to any self respecting supermarket. 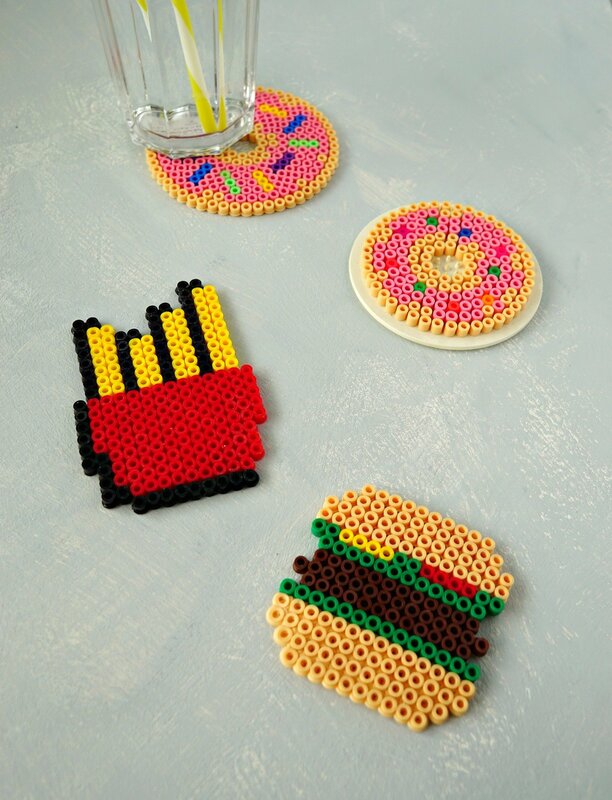 One very fun use for perler beads is to make coasters. You can make them in any color and size you want. 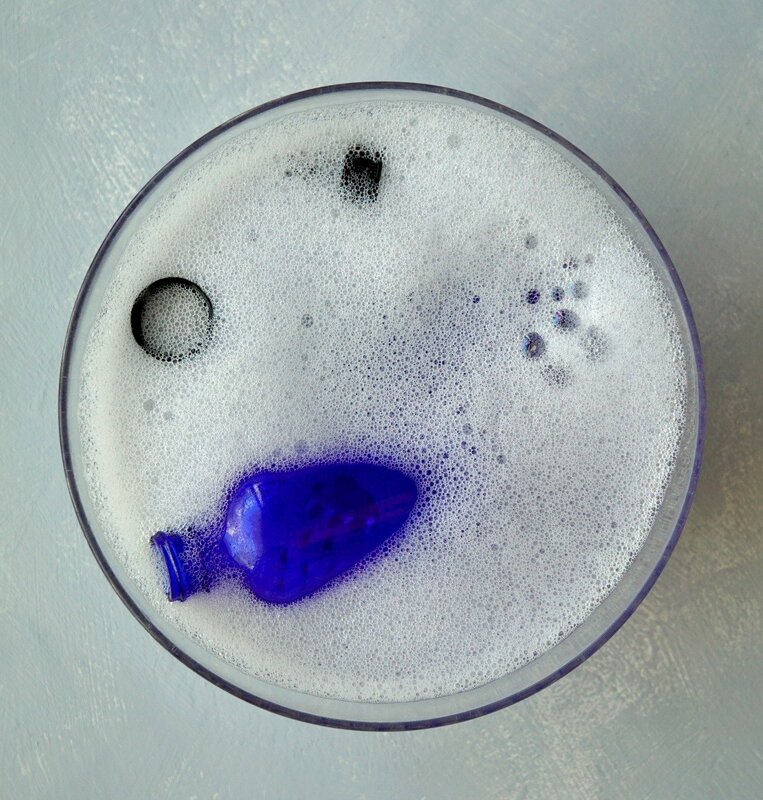 And because the beads are made of plastic, they can outlive quite a few summer cocktails. 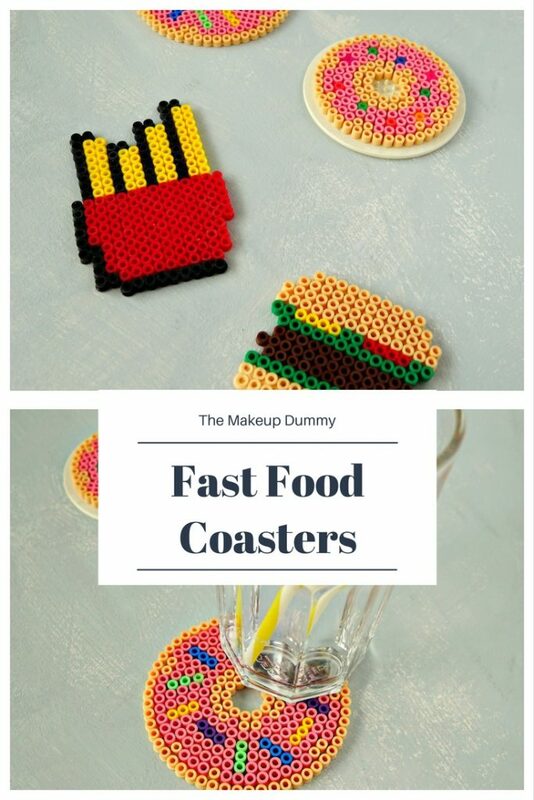 For this DIY tutorial I decided to try and make several of my favorite fast food dishes! I decided to start with the easiest coasters first. Donuts are pretty much colorful circles with holes in the middle. 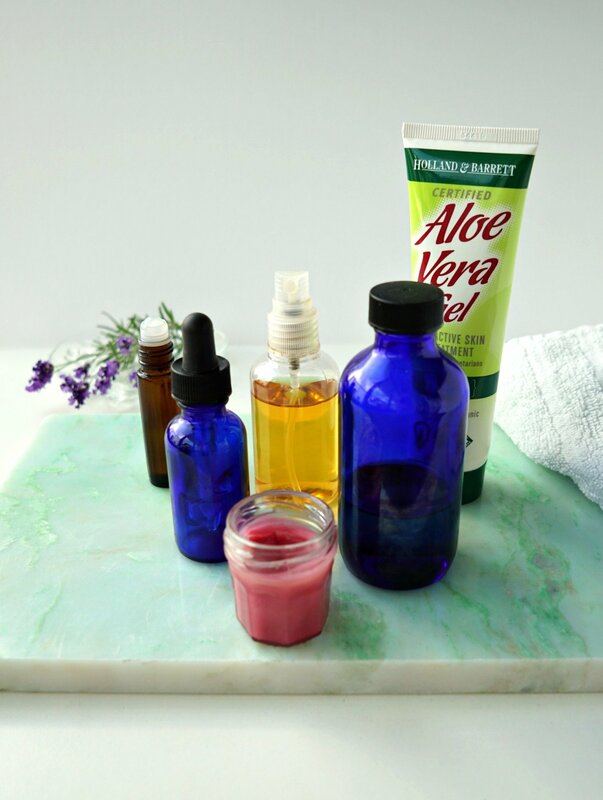 And I found lots of inspiration on Pinterest! I used a circular pegboard and formed the inside and outer rim of the donut with beige/pale brown colored perler beads (I believe the exact color is called “sand”). And I used pink and purple beads for the “frosting”. I made the transition between the purple/pink beads and the “dough” a little irregular to make it look like the frosting is dripping down. On top of the frosting I created a few “sprinkles” to make the donuts a bit more colorful and fun. For the small donut I made the beads look like what we call “disco sprinkles”. I haphazardly scattered a few colorful perler beads in my design. For the bigger donut I decided to go with more traditional “long” sprinkles. Since the pegboard is made up of circles it was a bit challenging to make all of the sprinkles look straight. I mixed it up and used different colors for a colorful effect. Next I tried to make pizza. I tried to make a whole pizza as well as a slice, but neither of them were really successful. For the slice of pizza I used the pointy end of a heart shaped pegboard. But the angle was just too wide to make the pizza look just the way I wanted. 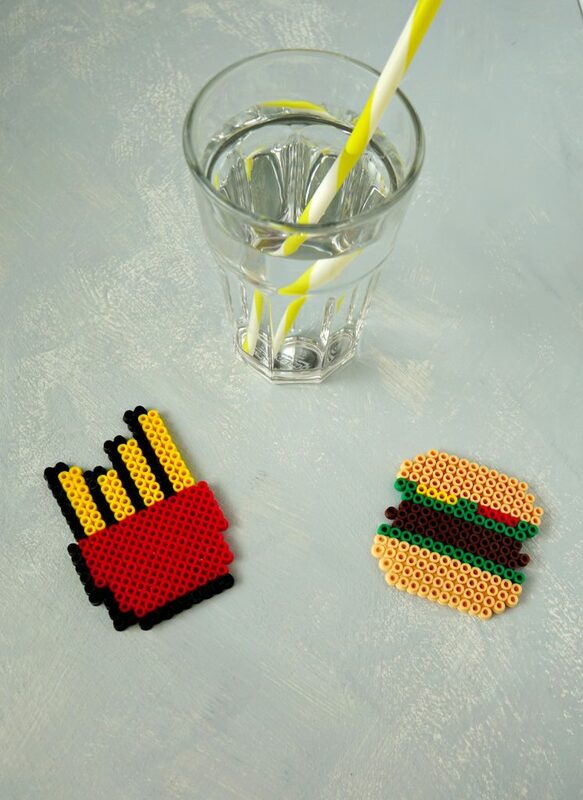 The most successful outcome of this little perler bead fast food adventure – in my opinion – is the French fries and hamburger duo. I used a regular rectangular pegboard to make both. And I think they turned out pretty great. What do you think? Once you’ve made your designs you have to turn them into coasters off course. 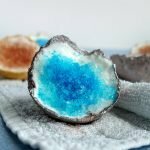 You do that by fusing the beads together with heat. Place the beaded pegboard onto an iron board. To make sure the beads won’t stick to the iron, place a piece of baking paper on top. Iron over the baking paper. The heat that comes through will start to melt the top of the beads. The melted plastic will stick together and close any gaps between the beads. Carefully remove the coaster from the pegboard and let the plastic dry. Once it’s cooled off it’s ready to be used all summer long!